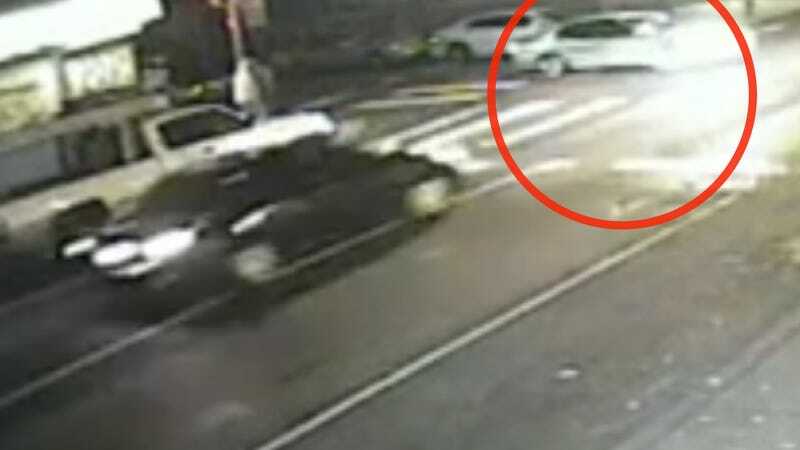 An officer with the Philadelphia Police Department's accident-investigation unit reached out to Jalopnik seeking help identifying a vehicle involved in a Saturday morning hit-and-run which left a 25-year-old woman badly injured. As it stands, police have narrowed it down to "possibly a mid to early 2000s Pontiac." The victim was traveling south on 2nd Street with a green light. The offender vehicle was traveling west on Westmoreland, entering/creeping into the intersection against a red light. The front end of the offender car contacts the driver's side of the victim's car. The victim's car starts to rotate out, counterclockwise, impacts a parked car on its right. The front passenger crashed through her window partially, exposing her arm, which also contacted the parked car. Her arm was nearly severed; the humerus shattered, the skin stripped away from below the shoulder to the elbow. Her arm was surgically reattached. We don't yet know if it will take or not. As of Monday night, no eyewitnesses have come forward, and the victims are unable to identify the vehicle. Having located that video, investigators are trying to narrow down make/model in an attempt to track it down. Which is why they reached out to Jalopnik again. Details to start with: The car is a four door. It appears to have the "third" brake light mounted on the trunk, or a mini spoiler, and it had a distinct contour on the doors.